Many people still believe that Hitler faked his death and escaped. This newley released article hopes to put those rumors to sleep.
" A team of French researchers who recently examined Adolf Hitler's remains say the leader of the Nazi party definitely died in Berlin and not elsewhere, as has been rumored about for decades. " Still not going to stop some of those who believe he faked his death from changing their minds. We have proof the Earth is not flat..that does not stop some thinking otherwise. I've told you, if the Earth was round, the water would run downhill and your boat wouldn't move! We got an engine on our boat for times when we reach the flat Earth spots. You are invited to come on my boat, you get to use the paddle. Ooh, I get to drive the boat! Remind me...... Which way is portboard? Sorry, i have changed my mind, you can stay in the galley and make the tea. Apologies for the tinfoil hat, but surely someone with Hitlers influence could have had his dental -and all other medical- records swapped out for those of his 'disposable' double in the event that he had to believably fake his own death, to avoid being pursued. Just a thought. I thought they already checked the teeth and skull fragments and it turned out they belonged to a woman, or correct me if i am wrong. Besides he truly is dead by now . Never thought otherwise. A megalomanic like Hitler could never have kept quiet for long. If he and his minions has escaped to S. America en masse, they would likely have at least tried to reform the Nazi party. So let me get this right. With all the questions regarding his possible escape over these many years, no one thought about dental records before now? To me its far more likely he had an escape plan, and left. I don't understand why that sounds crazy at all. Nor does it mean he faked his death. It just means he probably left. It isn't his fault we grabbed the first burnt skeleton we could find and declared him dead. Its been a long time since I've looked at all this, but wasn't the skeleton in question actually female once they were able to identify DNA? you'll always find those special people that think Hitler survived and played hide and go seek with the victorious allies for no apparent reason other than he could. i wonder what Hitler would have though of modern day Germany and its extensive migrant communities? just that alone would have given him fatal heart attack in the 1960's. "In 2009, researchers from the University of Connecticut did DNA testing on Hitler's skull and concluded that it belonged to a woman, between the ages of 20 and 40. However, the Russian government argued that it wasn't a woman. But this new study with the teeth goes to show that Hitler had killed himself in 1945. The dental records were checked a long time ago and they matched. The skull fragments belonging to a woman probably didn't come from the same set of remains. They simply did a new analysis and they still match. I was going to post this story here yesterday morning, but I was on may way to a lunch date. I've always felt the escape theories weren't the craziest conspiracy theories I'd ever heard, but were not very likely at all. This only cements it. Glad he died that day, in any case. After watching 3 seasons of Hunting Hitler, and seeing all the evidence they uncovered of blatant Nazi activity all over South America, I think they found a viable escape route (two actually). The evidence is pretty overwhelming and I'm sorry, just don't trust the Russians to not have fudged evidence to suit their narrative. Spoiler alert ... oak island show - season 2 or 3 or whatever and they still didn't find anything lol... I'm not say there isn't anything in the pit.. but after the second they've done , if they really found something the show would be done and they would be all over the news ... but the people watch the shows episode by episode hoping they will find something . .. NEWS ALERT : the season has already been filmed lol... and nothing was found... so I'm pretty sure episode 4 through 8 they didn't find anything. I agree with oak island, tho I do enjoy the historical aspect of their investigations into objects they find.. As for hunting hitler, it wasn't like that, they followed trails based on a lot of recently declassified documents and with boots on the ground and really investigating, using some sophisticated equipment, they explored many avenues. They actually found many live eyewitnesses and documents cooberating routes of escape. Again, I was shocked at the level of blatant Nazi activity all over South America. They found evidence of over 700 Nazi type camps for govt dissenters that flew Nazi flags in the 1970's. Who knew? Great they have his remains and his DNA, they can make another Hitler. This photo proves that Hitler was still alive after 1945. The rest of the Nazi Heirarchy wanted him dead anyway. If he did survive, he didn't go with the rest of them. And surely a doppleganger would have mostly the same dental work. A good stunt double wouldn't just wear the side shed wig, jodhpuris and hot chocolate moustache. A source known and valued for its incisive journalism and lack of partisan support. /AND/ Hitler would have approved of it, too! Charlier and other researchers persuaded the Russian government, the entity that discovered Hitler's body, to let them look at the last bits of his remains — a part of Hitler's skull with a bullet hole and a set of teeth. The teeth were compared to the autopsy done in 1945 and it was confirmed they were indeed Hitler's teeth. The study also showed that his teeth did not have any traces of tartar or meat particles, indicating he was a vegetarian, according to Tech Times. "The teeth are authentic, there is no possible doubt. 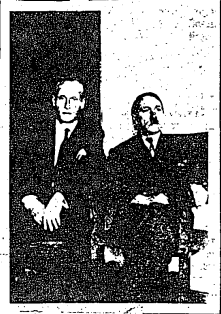 Our study proves that Hitler died in 1945," Charlier said in comments obtained by The Washington Post. Hang on am I missing something? In reading the article there is no evidence presented that these are Hitler's teeth. These researchers decided that because the teeth were those of a vegetarian, and because they matched the teeth in the autopsy from 1945 , that they must be Hitler's teeth and that is more reliable than DNA testing?